I have crossed a lot of things off my to do list this week. I plan to get another painting finished tomorrow as well. 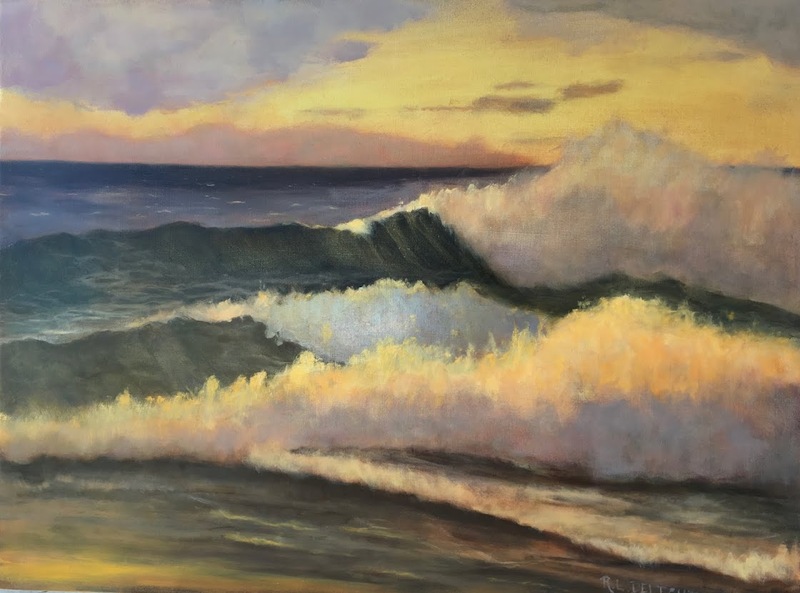 Which reminds me, available paintings for my Workshop Fundraiser can be found here. I will post a link somewhere in the beginning of each post for the duration. The following is a bit of technical painting geekery so you have my permission to skip it if you are not interested and come back to read my next post! However, this is one of those behind-the-scene things that goes into a painting. Roughly for rows 1-8, I mixed yellows with blues except for the last 5 columns. I mixed the paint 50/50 more or less. I just wanted an idea. I have messed around with these colors enough to know that I can shove them one direction or another with the addition of more color. Underneath each row of mixture, I painted another one mixed with white. The final 5 columns I added a third hue, one of each of my reds mixed with each of the two blues. Sounds complicated, I know, but it works really well for me. Rows 9-14 I used my greens to mix with the blues. Here is the actual list of paint going across: Ultramarine Blue, Cobalt Blue, Cerulean Blue, Burnt Sienna, Raw Sienna, Raw Umber, Ultramarine Blue+Alizerin Crimson, Ultramarine Blue+Cad. Red Deep, Ultramarine Blue+Cad. Red Lt., Cobalt Blue+Cad. Red Deep, Cobalt Blue+Cad. Red Lt. I added Cerulean Blue and Raw Umber just to try. I don't use these in my current palette. The only new paint I added to try in the line up going down the chart is a yellow ochre from Michael Harding. I wanted to see how it compared to the one from Gamblin. I liked it very much and will try it in the field when I use up the Gamblin. 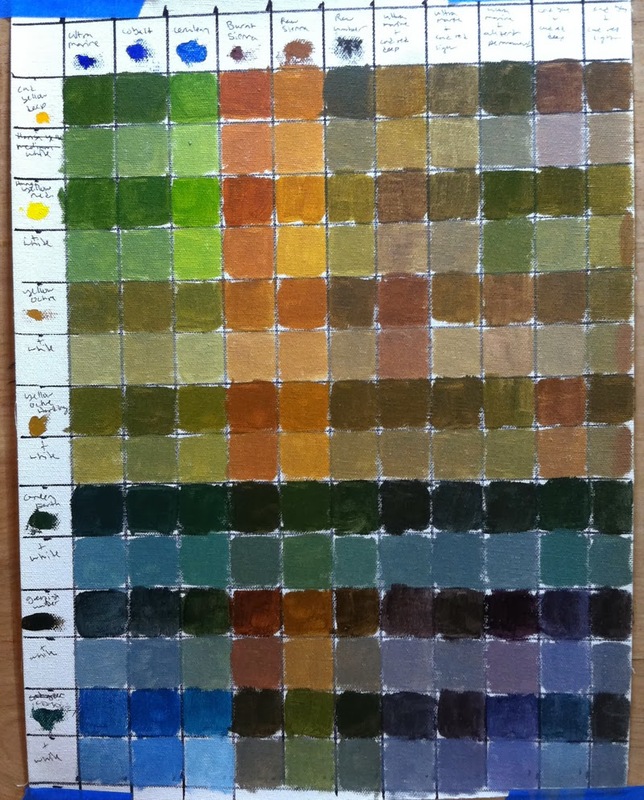 Color chart for new paint consideration with inset from first chart. 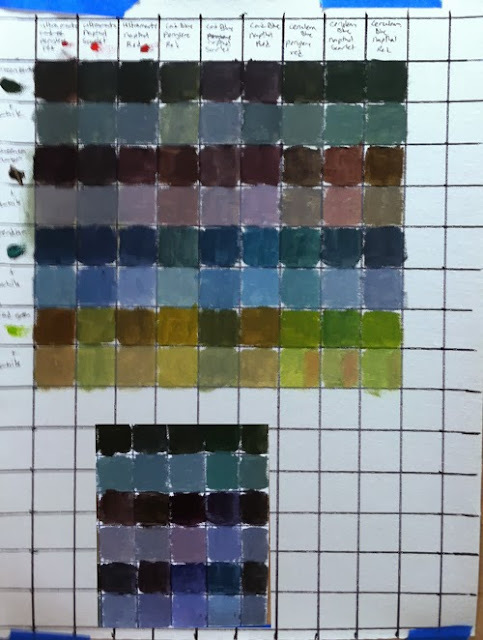 I pasted on a snippet from the first color chart with the cadmium reds to the bottom of this chart to give a general reference for comparison. Again, these are not precise, just somewhere in the neighborhood. I used Perylene Red, Napthol Scarlet, and Napthol Red, all from Gamblin and semi-transparent, for the reds in this chart. Quite honestly the difference was very slight. The reds were tricky to use since I am not used to them and I had a tendency to add too much. It didn't take very much to go too far either. I have decided to give the Perylene red and Napthol Scarlet a try out in the field and I am going to drop the alizerin permanent for a time as I rarely use it. I will have a report after I have used them for a few times. The bottom two rows (not on the inset) are using cadmium green. I had it and thought I would throw it in to see how it worked. I won't be using this green but I might try cerulean blue or the raw umber once in a while. I am happy I did this as I now have a reference when I get stuck trying to achieve a certain color. I did another notan sketch for the next painting and will have a bit more on that along with another painting for me next post. If you made it this far you get a virtual gold star and a heaping of gratitude from me.